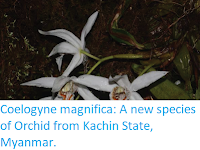 Sciency Thoughts: Dendrobium naungmungense: A new species of epiphytic Orchid from Kachin State, Myanmar. Dendrobium naungmungense: A new species of epiphytic Orchid from Kachin State, Myanmar. 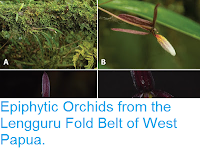 Myanmar is considered to be a hotspot for Orchid biodiversity, with a current estimate of around 800 species, which is probably somewhat lower than the actual figure. 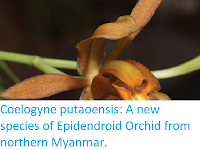 Despite this high level of diversity the Orchids of Myanmar have been little studied in recent decades, due to the country's political isolation and instability. The genus Dendrobium, is one of the largest Orchid general, with somewhere between 800 and 1500 species found across South, Southeast and East Asia, and Austrolasia as far as New Zealand. These are members of the Epidendroideae, the largest subfamily of Orchids, with over 15 000 described species, more than all other Orchid groups combined, and are usually tree-dwelling epiphytes (live on other plants, typically in the canopy of rainforest trees). In a paper published in the journal PhytoKeys on 29 January 2018, Qiang Liu and Shi-Shun Zhou of the Southeast Asia Biodiversity Research Institute and Xishuangbanna Tropical Botanical Garden of the Chinese Academy of Sciences, Xiao-Hua Jin of the State Key Laboratory of Systematic and Evolutionary Botany at the Institute of Botany of the Chinese Academy of Sciences, Bo Pan, also of the Xishuangbanna Tropical Botanical Garden of the Chinese Academy of Sciences, Kyaw Win Maung of the HponkanRazi Wildlife Sanctuary, Myint Zyaw of the Forest Research Institute of the Myanmar Forest Department Ministry of Environmental Conservation and Forestry, and Ren Li, Rui-Chang Quan, and Yun-Hong Tan, again of the Southeast Asia Biodiversity Research Institute and Xishuangbanna Tropical Botanical Garden of the Chinese Academy of Sciences, describe a new species of Dendrobium from Kachin State in northern Myanmar. The new species is named Dendrobium naungmungense, meaning 'from Naungmung', in reference to the town of Naungmung, close to the site where the species was discovered. 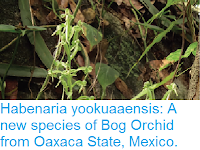 This is an epyphytic Orchid found growing on the trunks of trees on riverbanks in a tropical forest at an altitude of between 500 and 600 m above sealevel. The plants are pendant (i.e. hangs from the trunks of the trees rather than standing erect) and reaches 30-50 cm in length, with slender stems and narrow, lance-shaped leaves. Flowers are born on bracts, and are greenish yellow and scented. Dendrobium naungmungense. (A) Habitat. (B) Plant. (C) Flower. (D) Lateral view of flower. Quiang Liu in Liu et al. (2018). The species was only found at a single location, with a total of about 20 mature plants observed, despite three years of fieldwork having been carried out in the area. For this reason Liu et al. recommend that the species be treated as Critically Endangered under the terms of the International Union for the Conservation of Nature’s Red List of Threatened Species.